This week's photo prompt is of a sculpture taken at a specific angle. 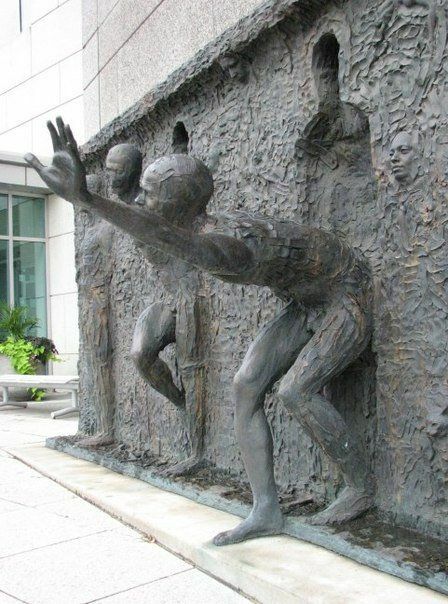 This was created by Zenos Frudakis, an American sculptor and this is called the Freedom sculpture and can be found at 16th and Vine Streets, Philadelphia, Pennsylvania. He does interesting work. As I always do, I tried to make this one original and create something more than the picture initially portrays. I think it worked. I like how it turned out - my kind of horror. It was busy; I had to squeeze my way through to the front side so I could get a good view. I hadn’t imagined so many would turn out – although I knew I hadn’t been the only one. They were still setting up; preparing the three moulds. The hum of the cement mixer could be heard just above the noise of the crowd. I was excited although I wasn’t sure it was appropriate to be. I wondered if this was how it felt centuries ago, when others had witnessed such events. People called it the completion of a cycle – the fact that it had come back round again. I just thought no other deterrent worked as well for these kinds of finite crimes. People still opposed it, but it had brought about positive changes in society, which had really needed to change. The Crimes Against Humanity bill had made human lives valuable again, over money, over power. And people had begun to feel safe again, and come together as a community. Like today, with these people coming together to see justice being served. These three had been caught red-handed – literally with the blood of their victims on their hands. They’d killed in haste, trying to cover what they’d done, but it hadn’t worked – luckily for me, otherwise I wouldn’t be here today to bear witness. I glanced round the crowd and saw two other girls I recognised. One glanced up at me and gave me a tight smile, I returned it. She pushed through the crowds towards me and I made room for her, pushing some people back so she could stand next to me. She sought my hand, and I grasped hers, giving it a squeeze. We didn’t need to speak – in fact we couldn’t, thanks to their fear of us ever getting loose – this was our day of retribution. We’d spent years in that hell hole being their ‘play things’. We’d never get that time back, or our tongues, and although the trauma we went through would permeate every aspect of the rest of our lives, this day would help us recover our sense of justice and safety. They brought the three men out, shackled, their eyes wide and unbelieving, stumbling across the makeshift podium. My mouth twitched at the edges. It was their turn to experience humiliation and horror. They poured cement into the bottom of each mould, just enough to attach the men to it, and pushed each one in, fixing them with a special scaffold that would hold them in place while it set. I had read the literature on the process: the type of cement they used on the first part was a special mixture that dried superfast; within half an hour they would be held fast. Then the moulds were hoisted upright, so we could see them lying in them, stuck to their casings, alive and aware of everyone around them. Someone threw an egg and it smashed on the face of the middle one. He could do nothing to wipe it away with his hands already fixed in the hardening mixture. Then there was a volley of people throwing anything they could find, and I laughed. It was hearty and I felt it deep in my core, but my eyes ran with tears and I found myself struggling to breathe as I fought between the ecstasy of release and the pain of my emotional wounds. The girl next to me held me upright, and made cooing sounds to comfort me and eventually I was able to return her embrace and we let the tears fall unhindered. Only when one of the larger items opened a gaping facial wound on the man on the left did the barrage stop, the audience showing more concern for their victims than the men ever had. After an hour the crowd started to thin, but I remained, as did the girl next to me. I had thought I’d never be able to watch such suffering, but with these men I had no compunction – they deserved every second of it. When dusk fell, the features of the captive men were no longer visible so I decided to leave. I considered returning in the morning to see the final encasing, but by the time I reached home I knew I didn’t need to see or experience any more suffering. Today was enough. Maybe next month I’d return to the gallery to see how they’d been placed among the other sculptures of encased murderers and rapists. I wanted to try something a little different, so I borrowed an idea from Jewish lore for this story. It's a little horror, a little romance, a little sad. Available on either link. 352 words. A sad tale. Thanks for joining. Finally, I'm catching up. Hope to write for 103 on Wednesday. :) For now, let's just say I've been watching way too many episodes of Ancient Aliens.